Yes, you can! The proven, systematic approach to uncovering and conquering those career-stalling inner-voices that say you can't Women are changing the game in business and beyond. As companies invest in systems and policies to address traditional biases against women in the work... read full description below. Yes, you can! The proven, systematic approach to uncovering and conquering those career-stalling inner-voices that say you can't Women are changing the game in business and beyond. 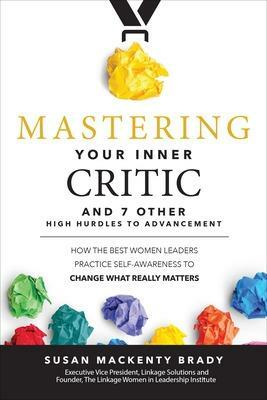 As companies invest in systems and policies to address traditional biases against women in the workplace, those who make personal changes around the things that are within their control--namely, their inner critic and the other hidden hurdles to advancement--will benefit most. Mastering Your Inner Critic provides the knowledge, insight, and tools you need to take full advantage of this powerful movement. The author shows how to uncover the behaviors, actions, or stereotypes women too often perpetuate and reveals proven ways of taking control of them through a clear, hands-on approach. In no time, you'll build your confidence, set clear goals, build effective networks, negotiate with skill, combat inner-biases, and much more. Susan MacKenty Brady is Executive Vice President at Linkage, where she has led the growth and development of the firm's global practice in Advancing Women Leaders & Inclusive Leadership. She serves as the co-chair of the company's Women in Leadership Institute (TM), which is now in its eighteenth year.